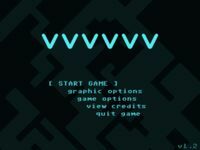 "VVVVVV is a 2D puzzle platform video game, built using Adobe Flash for Microsoft Windows and Mac OS. Featuring a gravity flipping game mechanic, the game was developed by Terry Cavanagh and was released in 2010 alongside an online demo. A Linux version of the game was planned, but is on hold due to problems with Flash support on the operating system. However, the game is playable on Linux through Wine." Source: Wikipedia, "Vvvvvv," available under the CC-BY-SA License.